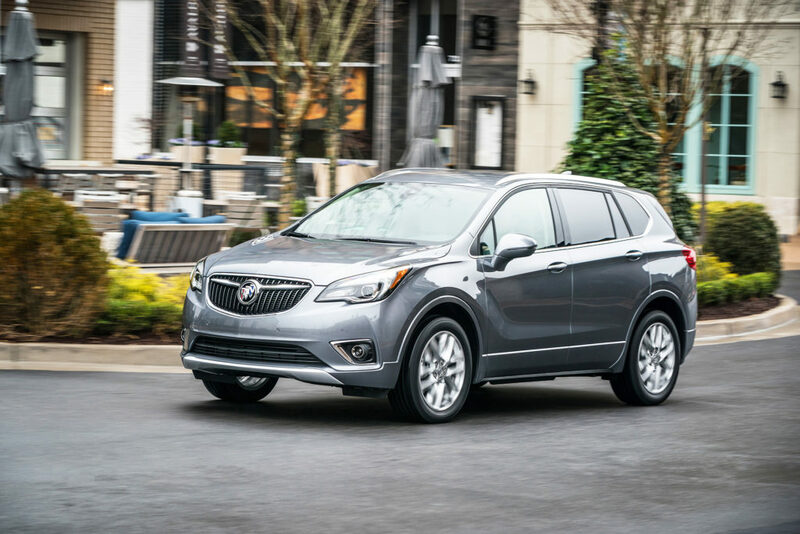 The Buick Envision launched without much fanfare in 2016, but it’s quickly grown into one of the brand’s top sellers. That’s no surprise considering the Envision is a midsize crossover, the kind of practical but stylish vehicle with enough popularity to put sedans on the endangered-species list. It also means buyers have nothing but good choices in this space. Car companies are engaging in a Wrestlemania-style smackdown by pouring development and content dollars into what has long been the fastest-growing segment of new-car sales. The Envision delivers a one-two punch for 2019. Like many of its competitors, it’s adding new features and upgrades for the new model year with a noticeable refresh. A better available drivetrain tops the upgrade list by offering a thoroughly modern nine-speed automatic transmission and more powerful turbocharged engine. Revised styling and upgraded content keeps the Buick Envision looking sharp for another model year. Pricing is also lower, including a $2,000 drop on the base trim. Unlike most of its competitors, though, it’s also lowering the price. The 2019 Envision base trim is a whopping $2,000 lower than the 2018 version, and the discounts continue at the higher trim levels, too. Whether that’s correcting a pricing error, trying to aggressively increase its market share or preparing for possible Trump-era tariffs is up to interpretation and debate. The Envision is assembled in China and potentially could be affected by political trade winds. Whatever the reason, the combination of a price cut and more features makes the Envision more appealing than ever. Styling changes are subtle. A revised grille and new fascias in front and back look more sculpted, keeping it fresh without losing its identity. The differences are bigger under the skin, though, starting with that spectacular new drivetrain. I haven’t driven the base Envision, powered by a 2.5-liter four-cylinder engine that makes less than 200 horsepower, something I’d guess is underwhelming. The version I drove was fitted with the better engine — a 2.0-liter turbocharged four-cylinder — that makes a much more palatable 252 horsepower and downright impressive 295 pound-feet of torque. Mated to the nine-speed automatic, it feels like a perfect fit for the premium as-tested price around $48,000. Not surprisingly for a Buick, handling is adjusted more for isolation and comfort than excitement. Personally, I love crossover vehicles that are silent and compliant like this one, but people who prefer a livelier ride can find it elsewhere. The Envision’s cabin feels roomy and upscale. With Buick’s distinctive smooth, quiet ride, it’s an ideal space for soaking up miles of highway pavement. Much like a hybrid car, the Envision’s engine shuts down when it comes to a complete stop to save fuel. Its smooth restart doesn’t bother me, but pickier drivers will be pleased to learn Buick added an on-off switch for this feature. It also adds a switch to let drivers choose between old-fashioned cruise control and the newfangled adaptive cruise that adjusts the vehicle’s speed automatically in traffic. I also like the little details Buick improves this year. A new brake booster upgrades both performance and feel at the pedal; the rear-view camera has a better picture; heated seats warm up faster than before; the wireless charger offers more wattage and compatibility with more phones, including the new iPhone 8 and X; and an air ionizer helps the cabin smell clean and fresh. Individually, the changes are minor. Taken as a whole package, though — especially when coupled with the price drop — the latest Envision is noticeably more compelling. Pricing starts at $31,995 for the base front-wheel-drive model and ranges up to $44,795 for the Premium II level with all-wheel drive and a long list of luxury features, including heated and cooled seats and a heads-up display. Already a popular choice for Buick buyers, the midsize Envision gets a lower price and more features for the 2019 model year. It offers a serene highway experience and better performance with an upgraded engine and transmission.